Findings may explain how Staphylococcus aureus bacterium can colonize our noses but not cause infection. 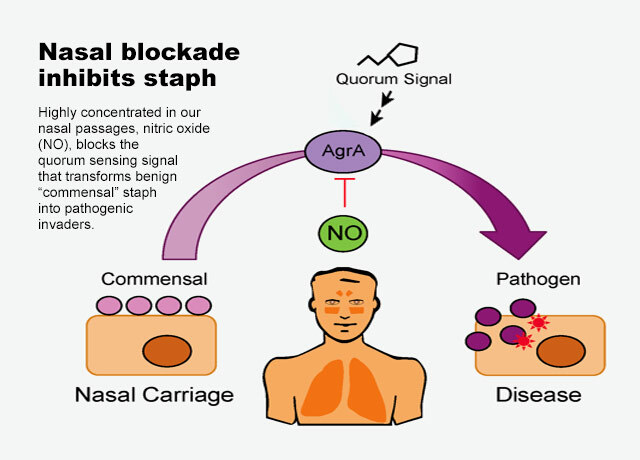 The molecule nitric oxide helps stop staph bacteria from transforming into invasive pathogens. According to the U.S. Centers for Disease Control and Prevention, about one in three humans carries Staphylococcus aureus, or “staph,” in our noses, and 2 percent of us carry the dreaded methicillin-resistant (MRSA) strain that thwarts common antibiotics. So how is it that most of us never get sick from staph infections? Researchers at the University of Washington School of Medicine have found a clue. "Immune molecules that target virulence factors could be used to develop new therapeutics,” said Rodolfo Urbano, lead author. In a study published April 26 in Cell Host & Microbe, the researchers show that an immune-system generated molecule called nitric oxide (NO) inhibits the ability of the S. aureus to transform from a relatively benign, quiescent colonizing state to its virulent form, producing toxins to invade and cause disease. This might explain why our nasal passages typically have very high concentrations of NO. The lead author of the paper is Rodolfo Urbano, a postdoctoral fellow at Yale University. He conducted the research as a doctoral student in the lab of Dr. Ferric Fang, UW professor of laboratory medicine, microbiology, medicine and pathobiology. He is the paper’s senior author. “At a time when antibiotic resistance is on the rise, immune molecules that target virulence factors could be used to develop new therapeutics,” Urbano said. The UW team collaborated with peers at the University of Pennsylvania and the University of Colorado. Urbano said our immune system uses NO as a weapon against many microbes including viruses, parasites, bacteria and fungi. As with most antibiotics, NO fights most bacteria by limiting their ability to grow. But S. aureus is able to grow despite the presence of NO. To find out how NO might be keeping S. aureus in check, the researchers set out to identify all the proteins in S. aureus that were modified by NO. Many proteins were altered, they found, but one protein in particular caught researchers’ interest. That protein, called AgrA, plays a key role in the process that switches quiescent S. aureus bacteria into virulent invaders. Dr. Ferric Fang was the study's senior author. This process is called quorum sensing; it's triggered when bacteria reach a certain density—a “quorum”— and initiates the process in which the bacteria begin to produce virulent factors such as toxins. By modifying AgrA, NO blocked this quorum-sensing system, Urbano and colleagues found. To confirm their hypothesis, the researchers showed that mice with staphylococcal pneumonia that lacked the gene needed to generate NO developed more severe disease. This demonstrted that NO can suppress the production of toxins during an infection, Urbano said. “The same effect may also apply when there is no ongoing infection,” he said. Fang noted that bacteria often find a way to evolve so they can resist the effects of antibiotics, but curiously S aureus appears to have not evolved to resist the effect of NO. Fang said his team hopes to better understand how NO protects the body, but also why it fails. Funding: This work was supported by National Institutes of Health grants T32 AI55396, AI39557, and AI123124.